Marketers have myriad tactics from which to choose. It's up to you to determine which will be right for your company, and which will deliver the most impactful results. The options for strategies and solutions in today’s marketing landscape can feel overwhelming, but here’s a secret: start simple, focus on your customers and you’ll quickly find the path that works best for your organization. Another secret: listen to your peers and learn from their experiences. 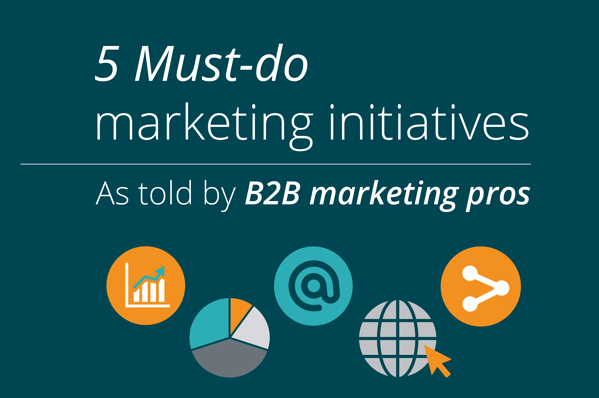 With that in mind, we asked five smart B2B marketers: Which marketing initiative has been most critical to your company’s success? This e-book captures their responses, plus advice for you to incorporate into your own marketing strategy.